JIMS test kit comes if terrific durable vinyl case. With the majority of Big Twin motorcycles being Fuel Injected it is necessary to have some special tools to keep them running right. One of those tools is a JIMS Fuel Pressure Tester. 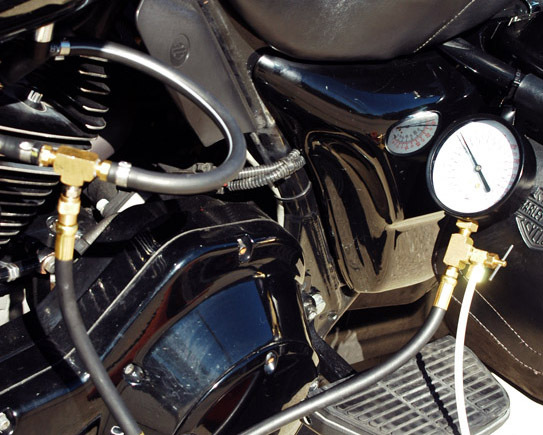 Granted there are numerous parts to the fuel system, but it all starts with having the proper fuel pressure. 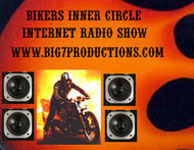 For Harley- Davidsons that is 55-62 PSI (pounds per square inch). Too low pressure can cause loss of power, hesitation under acceleration, stalling, back firing through the intake, poor fuel economy and even not starting. He said he was testing my fuel system, but I think I caught Rogue trying to steal my dresser. Is he guilty or what? 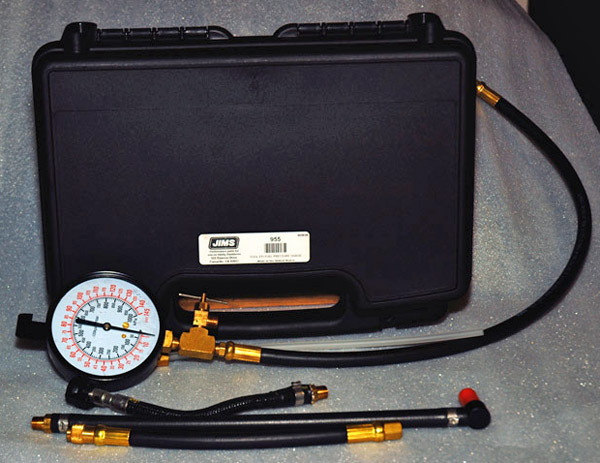 In about the time it would take you to change a set of spark plugs you can check your fuel pressure with the EFI Fuel Pressure Gauge Tool from JIMS Performance Parts. 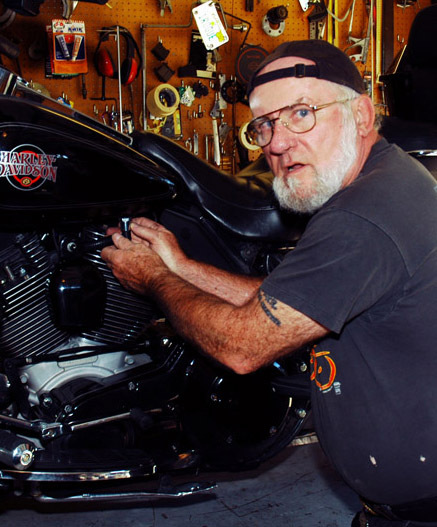 JIMS is well known for making specialty Harley-Davidson tools and recently added this one to their long list of products. Since you will be working with gasoline some caution must be taken. It's carefully covered in the instructions--NO SMOKING. To do the test start by removing the fuel pump fuse. Start the engine, and let it run out of fuel. 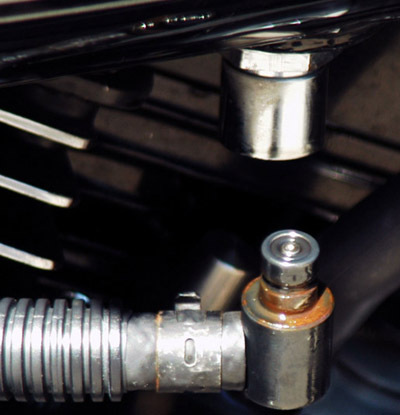 Push up on the chrome sleeve on the gas tank, while gently pulling down on the fuel line. Here's the other connection on the throttle body. Remove the other end of the fuel line by pushing down on the blue release while gently pulling on the hose. Fuel line removed. 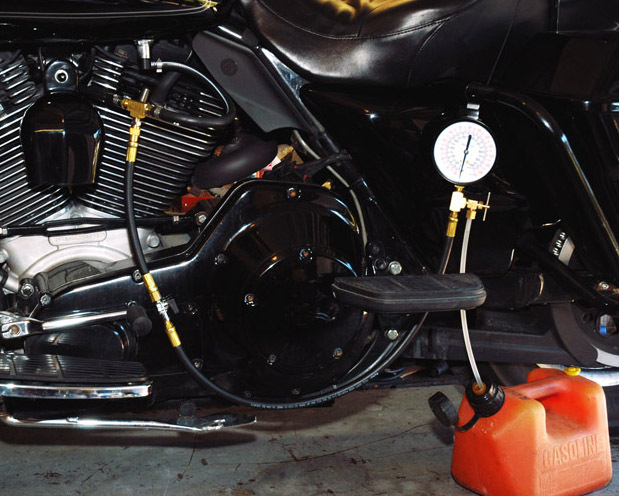 If your EFI Harley starts acting up, like it's running out of gas, check this O-ring or replace this line. If it get loose, it shuts off the fuel. 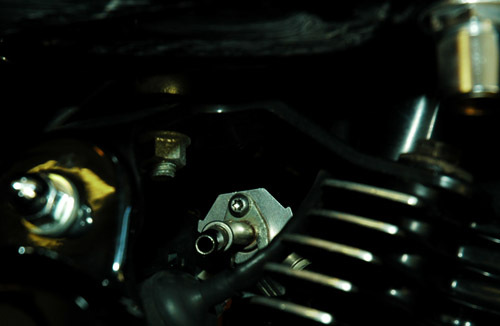 Depending on the model of your motorcycle you may need to remove the horn or other components in your way. I could very easily get to the ends of the hose on my 2004 FLHTI and wasn't forced to remove any other parts. 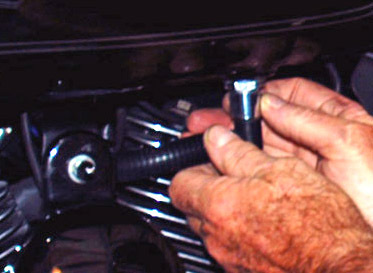 Install the hose from the kit where the original fuel line was, making sure the ends snap in place. Remove the black cap from the T on that hose and thread on the guage hose. Make sure the bleeder screw at the gauge is turned in and the blue lever in the line to the gauge is off. Re-install the fuel pump fuse and turn the ignition on for about two seconds. This allows the system to pressurize. Check to make sure there are no fuel leaks. If there are tighten the fittings and retest. The master trying to prove he's testing and not trying to bag our bagger. 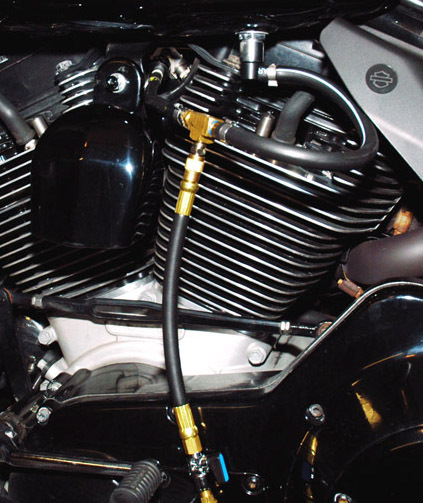 Place the clear hose in a gas can or other suitable container. Start the engine and open the inline valve with the blue handle. Slowly turn the Tee-handle counter clockwise to open the bleeder until all air is out of the system. CAUTION: Do Not Open Valve Too Much. Pressure should not drift below 20 PSI. When done close valve. Increase RPMs to 2500. Fuel Pressure should be steady between 55-62 PSI. If fuel pressure is within the limits test is completed. 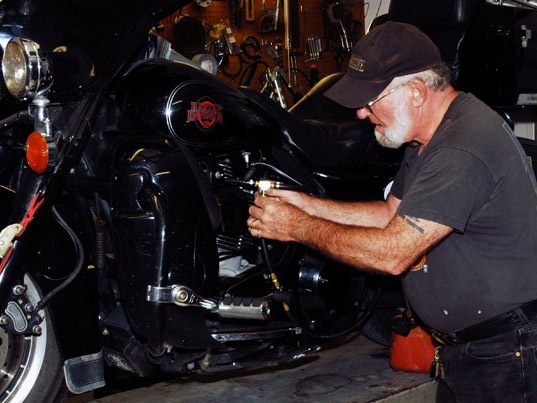 If pressure is not check Harley Manual for repair information. Turn off engine, open air-bleeder-valve until all fuel is drained from system. Let engine cool before removing test hoses and reinstalling stock fuel lines. For more information or to order contact JIMS at 555 Dawson Drive, Camarillo, CA. 90312 – Phone 805-482-6913 www.jimsusa.com.